description: The film was recorded in slow motion. In the frame, central: wooden countertops object - bronze thorn wreath, hands, which deal with the exposed object in a special way. 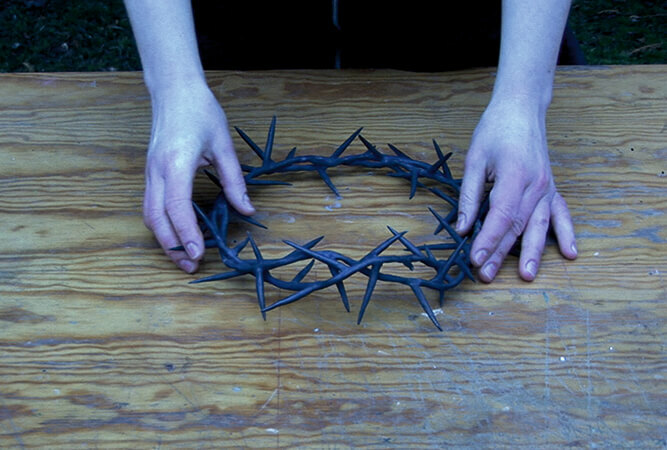 During the film, an anonymous person whose hands are only visible in the frame, rub the skin by persistently touching and stroking the sharp thorns of the thorns. The video image is accompanied by a mechanically processed male voice, which (deliberately with errors and partly with misunderstanding) recites the text of the original document from the Gdańsk court - justification of the final verdict of the judge in a criminal case against Dorota Nieznalska from June 4, 2009.